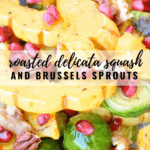 A fall side dish that will brighten any meal! 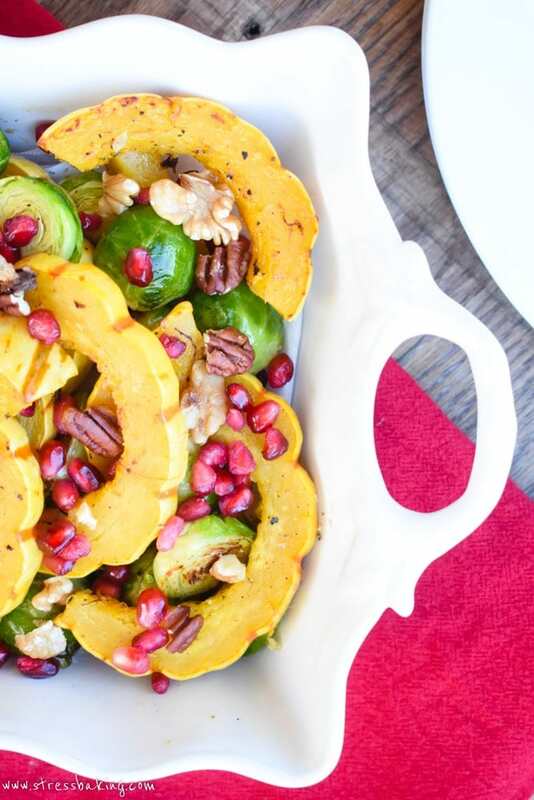 Roasted delicata squash and brussels sprouts are topped with pomegranate arils for gorgeous pops of color. I would like to submit this recipe as a last minute addition to your Thanksgiving dinner tablescape. 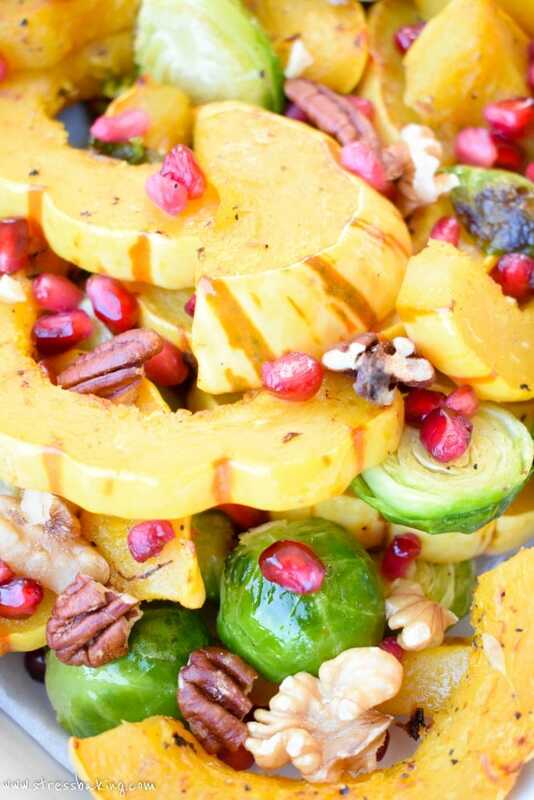 This dish is a combination of my favorite winter vegetables and fruit, which makes it perfect for any meal during the cold weather months. But I love everything about this so much that I couldn’t wait until after Thanksgiving to share it. I had to get it out there as soon as humanly possible. Fun fact: The first time I wrote the sentence above, it came out “I had to get it out there as soon as humanely possible”, which brought to mind visions of someone with a cattle prod that would poke me if I weren’t typing quickly enough. On the topic, this would be perfect for your Meatless Mondays. No meat, no dairy – just delicious veggies that will help you feel all warm and cozy. Oh, by the way, my train of thought up there: Cattle prod –> cattle –> meat –> no meat to be seen. The pomegranate arils aren’t just there to give things a pop of color – they give the dish a welcome sweetness and crunch. 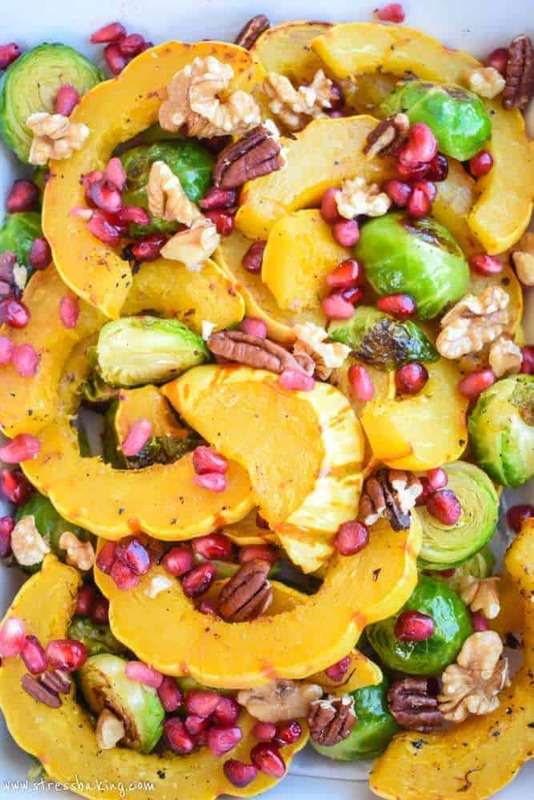 If you want a little more crunch, you can add some pecans or walnuts, or both if you’re feeling like getting a little wild and crazy. Despite being a veggie dish, it’s pretty hearty. 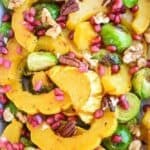 So if you’re serving this as a side on Thanksgiving, just be aware that you’d have a hard time scarfing down seconds of turkey, potatoes, stuffing, AND this. I know some of are thinking to yourselves, “Challenge accepted”. I can’t stop you. I can only advise you via the internet. With that said, everyone knows that everything you read on the internet is true, sooooo. Slice off the ends of the delicata squash, then cut in half lengthwise. Spoon out the seeds, then cut into half rounds, about 1/2″ thick. 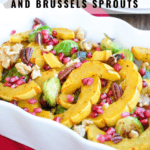 In a large bowl, combine squash and brussels sprouts with a large drizzle of olive oil, and salt and pepper to taste. 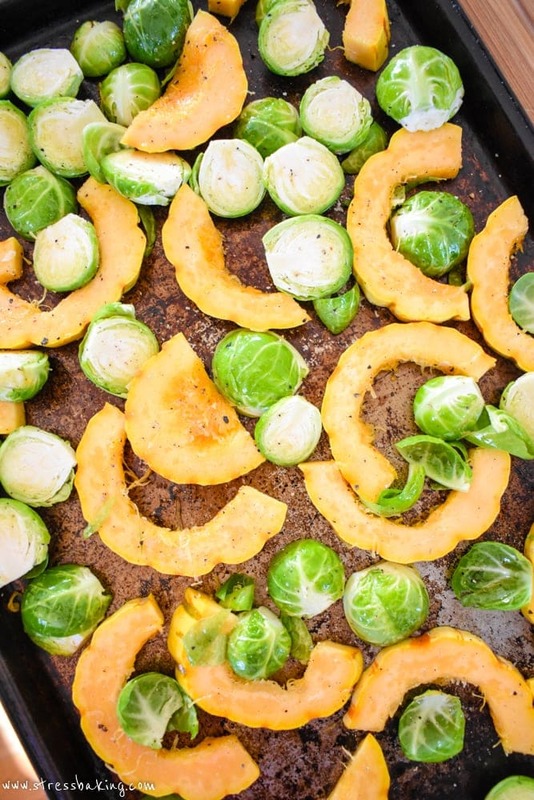 Toss to combine, then arrange in a single layer on a baking sheet. Roast for 30 minutes, turning halfway through. 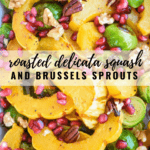 The squash should be softened and lightly browned, and the brussels sprouts should be browned and crisp on the outside. 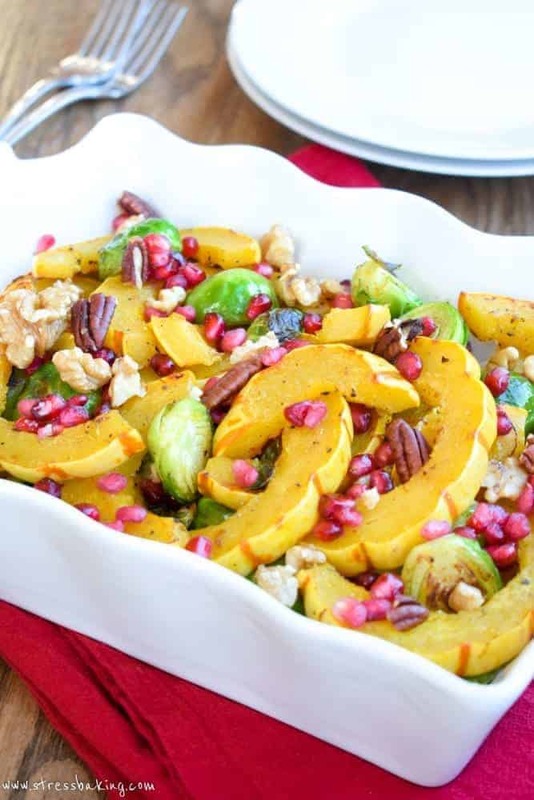 Place in a serving dish and top with pomegranate arils and chopped nuts. Serve immediately and enjoy!